Wigan boss denies defender set for Charlton switch said a headline yesterday. Headlines are meant to draw attention to an article. This one certainly drew mine. But did Gary Caldwell really deny that Jason Pearce might be heading for Charlton? It could be argued that the headline was misleading, but it has got fans debating as to whether a defender who was pivotal in the League 1 title winning triumph should be allowed to leave. Would Caldwell be willing to lose Pearce? It appears that the door has already been opened, given the absence of a comment from Caldwell saying that the player is staying at the club. The 28 year old Jason Pearce was signed by Malky Mackay in January 2015. Impressing in a struggling team was never going to be easy, but Pearce held his own and formed a solid partnership with Harry Maguire in the centre of defence. He went on to make 15 appearances from February until the end of the season on May 2. Then came a massive summer clear out by Caldwell, but Pearce was to become a rock upon which a League 1 title winning team was built. Pearce was to miss the start of the 2015-16 through injury, appearing in his first game in a home match against Crewe at the end of August. He partnered Donervon Daniels and Craig Morgan in a backline of three. Given Caldwell’s predilection to switch between three at the back and an orthodox back four, Pearce had to be flexible in his positioning, but was to be inevitably found on the left side of the central defence. His wealth of experience in the lower divisions made him invaluable defensively in Caldwell’s set up, particularly when playing in tandem with Morgan. Moreover Pearce had worked on his passing skills out of defence, rarely wasting the ball. Given the player’s willingness to totally commit him to the cause, putting his body on the line so often, it was perhaps inevitable that injuries would result. In fact he went on to make 33 appearances. It was a reflection on the effectiveness of the Pearce-Morgan combination that Latics did not lose a single game when the two appeared together in the starting lineup until the final match of the season against Barnsley. It could be that injury has once again intervened, preventing Pearce playing in the final two pre-season matches at Oldham and Fleetwood. If that is the case he will be among more than half a dozen of the squad currently suffering from pre-season injuries. However, rumours persist that the player wants to move back down south; moreover that Caldwell has already signed Buxton as his replacement. Could it be that Caldwell does not see him as effective a player in the Championship as he was in League 1? Jake Buxton’s arrival appears to be an indicator that Pearce is on his way out of the club. Buxton is a physical, combative player in the mould of Pearce and will fans are hoping he can reproduce the same kind of form at Wigan as he did during his prime at Derby, where he spent seven years, an idol of the fans. It can be seen as an indication of Caldwell’s regard for Buxton that he gave the player a three year contract at the age of 31. Pearce remains only 28. Is there not room in the defence for the two? Should Pearce move on Caldwell will be left with just one player in his senior squad recruited prior to his appointment as manager. That is Lee Nicholls, who faces competition from Adam Bogdan, Jussi Jaaskelainen and Dan Lavercombe for the goalkeeping position. Jason Pearce has earned the respect of Wigan Athletic supporters due to his commitment and willingness to put his body on the line for his team. Whether he will be at Wigan at the start of the 2016-17 season next weekend remains uncertain. Could have left last season for Preston (am aware of the Barnett rumours) … not the manager’s type of ball playing centre back but is Jake Buxton ? 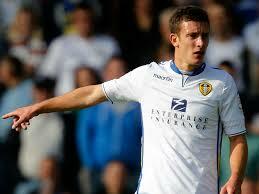 Jason Pearce should not be forced out the door and is just the sort of player needed for a long Championship season. Emyr Huws and Andrew Taylor ?